Fighting HIV-related stigma is a topic that I am extremely passionate about. Although in recent years there have been great advances in HIV treatment and in the fight against the spread of HIV overall, too many people living with HIV continue to experience the destructive and sometimes devastating effects of stigma perpetuated in their everyday lives. This includes almost all of my patients at the HIVE clinic and Family Health Center HIV Clinic, among countless others near and dear to my heart who have shaped my life and my path to becoming an HIV primary care provider. Even in our own city of San Francisco, a landmark at the cutting edge of HIV prevention and treatment advancement, as well as a site with such a rich legacy of activist movements furthering social justice for HIV positive individuals; the struggle against stigma remains as an everyday reality. Last year, in my final year of residency training in Family and Community Medicine at SF General Hospital, I decided to create a unique arts and advocacy project to give patients a safe space to share their experiences and together make their voices heard to fight stigma. What resulted was the first Photovoice project to be piloted at this site. What is Photovoice? Photovoice is a creative, community-based action method that utilizes digital photography with an aim to raise awareness and promote group empowerment, reflection and action to create social change. Photovoice puts cameras in the hands of community members and gives them a chance to show, through their eyes, what they feel are the most important issues through their photos. We brought together a small group of patients from the Family Health Center HIV Clinic, Ward 86, BAPAC, and the PRO Men program, to participate in a month-long series of group Photovoice sessions at the Family Health Center HIV Clinic at San Francisco General Hospital. In this Photovoice project, we gave out digital cameras and allowed patients to take photos that illustrate important themes in their lives that relate to living with HIV and fighting stigma against HIV in interpersonal relationships as well as in the broader community context. We then met weekly to share and discuss the photos they took, and used the photos as sparks to ignite critical dialogue and discussion about the issues they identified as most important. We had a group of very dedicated and courageous individuals who took photos and shared their stories through several group sessions. I am a huge fan of Photovoice because of its roots in social justice and collaborative learning. After all, social justice is the reason I decided to become a public health advocate and doctor in the first place. However, throughout my public health and medical training, I have found that all too often, health and medical “experts” are the ones doing all the talking and advising. With this project, I wanted to listen to what patients and their families had to say. And what I heard was absolutely powerful. Common themes that arose from the group’s collective photos and accompanying narratives included: struggling with and finding ways of disclosing HIV status to friends, families, and romantic partners, learning to start and maintain a healthy family while living with HIV, surviving and coping with HIV stigma, recovering from addiction, going from surviving day to day life, to thriving and finding sources of ongoing encouragement and support. By the conclusion of the sessions, all patients expressed improved emotional well-being and empowerment from sharing experiences with other group members, as well as renewed enthusiasm and confidence in fighting HIV stigma. 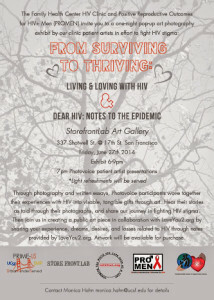 This project culminated with a pop-up interactive exhibit, “From Surviving to Thriving: Living and Loving with HIV,” in June 2014 at StoreFrontLab Art Gallery in the Mission District in San Francisco. 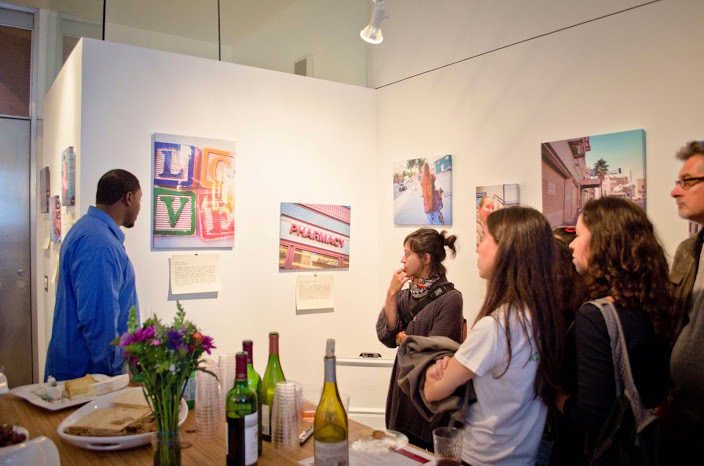 The photos from the project were displayed and each photo was accompanied by narratives written by each participant that described the significance of each photo and told the story behind each one. 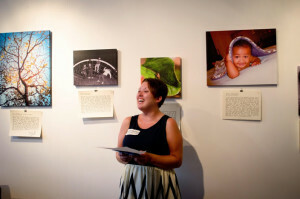 At the event, the project participants had the chance to share their photos with the community audience and describe why they took the photos and the meaning the photos hold for them. 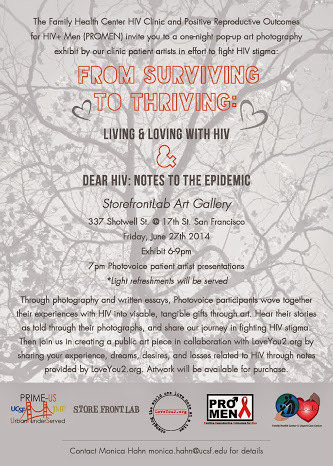 This was a very interactive event where the community member audience had a chance ask questions of the project participants, and then became a part of the project by writing their thoughts about what HIV stigma means to them on note cards adjacent to the artwork. In collaboration with HIVE Director Shannon Weber’s organization, LoveYou2.org, we filled the space with love notes from the community audience in the creation of a public art installation called “Dear HIV: Love Notes to the Epidemic”, where community members were able to add their collective voices to the exhibit and join the fight against HIV stigma in solidarity with our project participants. I am proud to say that several of the patients involved in this project have since participated in several awareness-raising events targeted at educating health providers and the general public about the experience of living with HIV. Several of their educational videos and bios are viewable on the HIVE website. I feel so incredibly fortunate to have had the opportunity to direct a project with a truly gifted group of individuals who are so brave and enthusiastic to share their experiences on a subject as personal and emotionally complex as HIV stigma. The experience of running this project was an unforgettable highlight of my residency training. I am forever grateful for the opportunity I had to learn from this inspiring, phenomenal group of people through this empowering process. I truly believe that we are at the beginning of a new era in the fight to end the HIV epidemic, and right now hope is stronger than ever. It is my intention and hope that projects like this one can continue to contribute to fighting stigma and spreading this hope, starting in our very own communities. Monica is an Assistant Clinical Professor at UCSF in the Department of Family and Community Medicine. 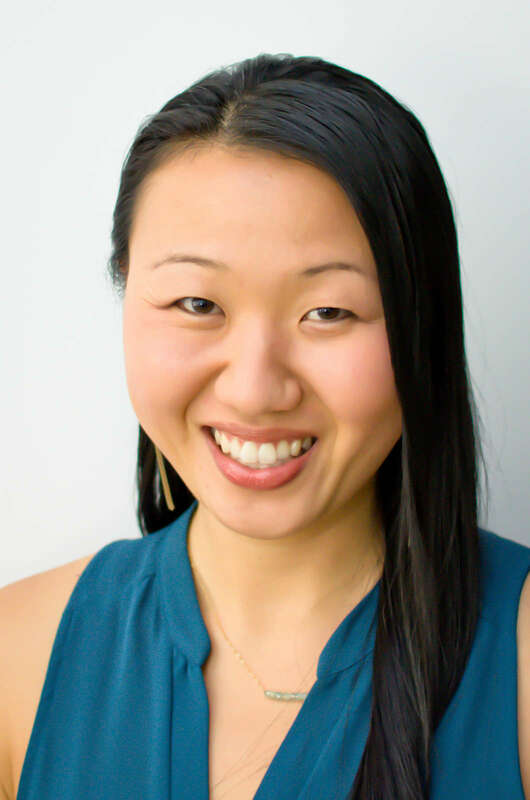 She is the Lead Clinician at HIVE Clinic and Interim Director of the Family Health Center HIV Clinic, and directs the HIV concentration pathway program for the UCSF/SFGH Family and Community Medicine Residency Program. She is also a primary care doctor at UCSF Women’s Health Primary Care. Outside of work you can usually find her dancing to Afro-Latin beats, training capoeira, or playing Brazilian drums with her husband and friends.